The bestselling inspirational book in which the author reunites with a childhood football hero, now a minister and coach, and witnesses a revelatory demonstration of the true meaning of manhood. Joe Ehrmann, a former NFL football star and volunteer coach for the Gilman high school football team, teaches his players the keys to successful defense: penetrate, pursue, punish, love. Love? A former captain of the Baltimore Colts and now an ordained minister, Ehrmann is serious about the game of football but even more serious about the purpose of life. 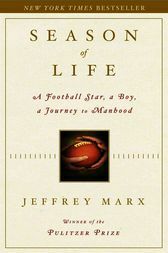 Season of Life is his inspirational story as told by Pulitzer Prize–winning journalist Jeffrey Marx, who was a ballboy for the Colts when he first met Ehrmann. Decades after he first met Ehrmann, Jeffrey Marx renewed their friendship and watched his childhood hero putting his principles into action. While chronicling a season with the Gilman Greyhounds, Marx witnessed the most extraordinary sports program he’d ever seen, where players say “I love you” to each other and coaches profess their love for their players. Off the field Marx sat with Ehrmann and absorbed life lessons that led him to reexamine his own unresolved relationship with his father. Season of Life is a book about what it means to be a man of substance and impact. It is a moving story that will resonate with athletes, coaches, parents—anyone struggling to make the right choices in life. Frank Deford, Sports Illustrated Jeffrey Marx has used the most violent of American games to show how men and boys should dare not be afraid to look for love. I was tremendously touched by Season of Life.